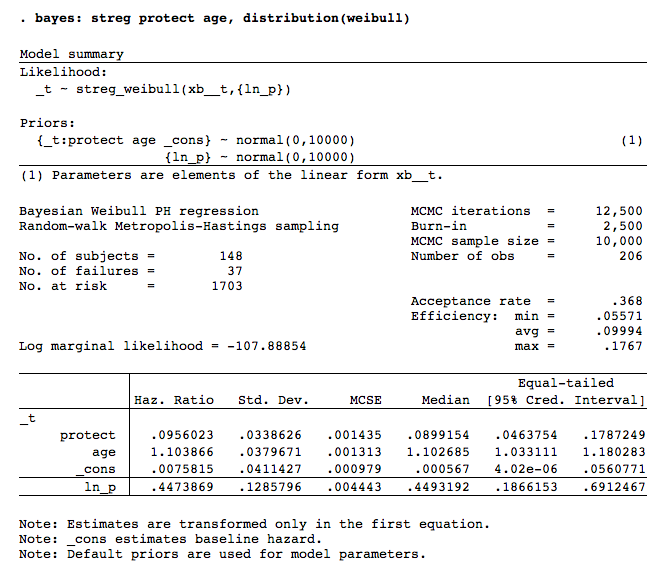 You can fit parametric survival models in Stata using streg. You can fit multilevel parametric survival models using mestreg. You can now fit Bayesian parametric survival models by simply typing bayes: in front of streg and mestreg! 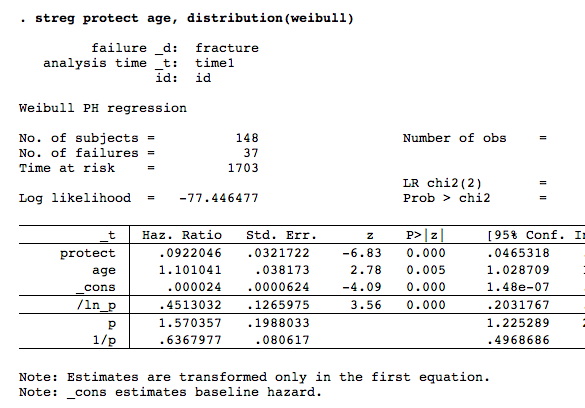 Consider a dataset in which we model the time until hip fracture as a function of age and whether the patient wears a hip-protective device (variable protect). Let's fit a Bayesian Weibull model to these data and compare the results with the classical analysis. First, we declare our survival data. Because the default priors used are noninformative for these data, the above results are similar to those obtained from streg. Instead of the default priors, you can specify your own; see Custom priors. The hazard ratios are reported by default, but you can use the nohr option with bayes, during estimation or on replay, to report coefficients. Alternatively, you can specify this option with streg during estimation. Unlikestreg, bayes: streg reports only the log of the shape parameter. We can use the bayesstats summary command [BAYES]bayesstats summary) to obtain the estimates of the shape parameter and its reciprocal.